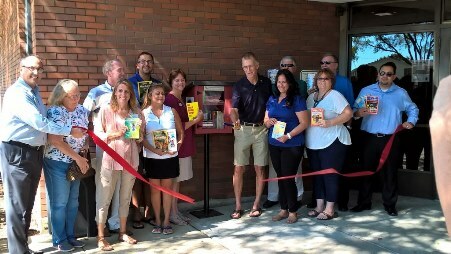 On Monday September 12, 2016 we had our official Ribbon Cutting ceremony for our very own Little Free Library here in Carpentersville. The few that gathered brought books to donate, and enjoyed a brief presentation as we made the Grand Opening official. Thanks to everyone who made it a success and a possibility! Remember you can find our Little Free Library located at the south entrance of the village hall or use coordinates Lat: 42.1178 Long: -88.2646 on your GPS to take you right to it! It's a simple concept really take a book.... leave a book! We would love to see you share your old books for others to enjoy and in turn receive the same joy from the books that others have left for you! The give and take concept is very important in order to keep the library consistently stocked. The Library will also contain Spanish books for the local demographic which is very exciting. Anyone with any interest in contributing books or monetary contributions to our Little FREE Library can contact us at CarpentersvilleRotary@gmail.com.